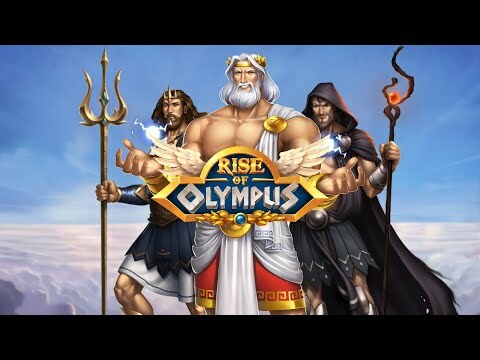 The Rise of Olympus slot features the Greek Gods Zeus, Hades and Poseidon. It has an unusual gameplay as winning combinations can be created horizontally or vertically on the 5 reels and 5 rows. There is a Wild, 2 bonus features that use the Gods special powers, a round of Free Spins and you can play for free at Neonslots.com. During the round the Hand of God feature will activate after every unsuccessful spin and if the meter is fully charged you can receive up to 20 additional spins. The multiplier does not reset and will grow by x1 with every spin up to a maximum of x20. However, the Wrath of Olympus feature cannot be activated. On the left of the reels you will see a meter that has 3 sections on it. Every time a winning combination is created with the active Gods symbols, the sections of the meter will fill up. If 3 God symbols are in a combination one section will fill up, if 4 symbols are used two sections will fill up and if 5 symbols are involved in a winning combo all 3 sections will fill up. Once all the sections are filled, the meter will be fully charged and the Wrath of Olympus Free Round will activate. The Gods will then take it in turns to use their Hand of God feature as described below. The activation of these features can help to create more than one winning combination. Find more free play slots with bonus features and free spins at Neonslots.com. It is also possible to create a winning combination using a mixture of the 3 Gods. The Wild is a gold coin that has the winged horse Pegasus on it, it can create its own combinations or be used to replace all other symbols to help create combos. The payouts for all the symbols are listed in the paytable and reflect your current bet setting. In the centre of the game screen of the Rise of Olympus Slot are the reels and rows, on the left you will see the current multiplier, an area that will show the winning combinations and the Wrath of Olympus meter. On the right you can see the God that is currently active. At the bottom of the screen there is a message area, a green spin button and a smaller orange autospin button. If you click on the i button you will open the paytable and information about the free spins and bonus features. You will also be able to see your balance, total bet amount, which can be changed using the buttons and arrows, and any winnings. Additional buttons in the left corner will open the game settings, turn the game sounds on or off and activate fast play mode. If you like to play slots with a Greek theme then discover the full range at Neonslots.com that are free to play.